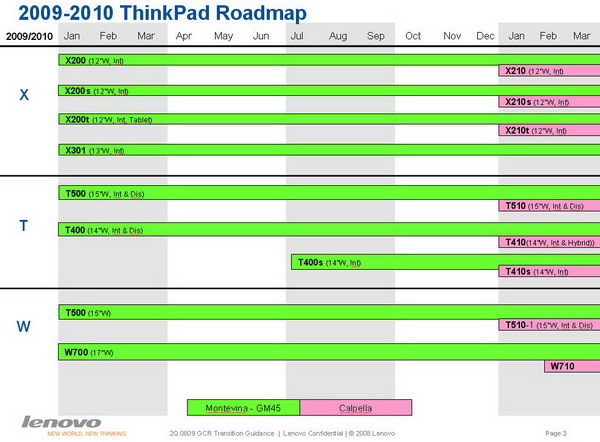 Leaked Lenovo roadmap shows Calpella laptops coming January 2010? Intel putting some ultra-thin laptop CPUs on hold to gauge demand? Acer launching thin, Calpella-based notebooks this summer? Intel Arrandale chips detailed, priced and dated? 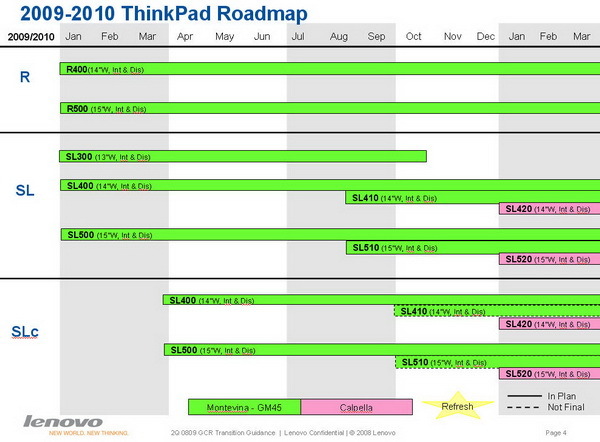 Our compatriots at Engadget Chinese have happened upon what looks to be a roadmap for Lenovo's upcoming laptops between now and March 2010. Recently in the wild T400s is on there, slated for mid-July or so, with a pair of new SL models following in August. More interesting than all that, however, is the sheer number of new X, T, W, SL, and SLc laptops listed for the beginning of 2010 that utilize Intel's upcoming Calpella platform. We're not gonna put too much stock into these pictures right now, but it definitely raises a few eyebrows. More slides after the break.